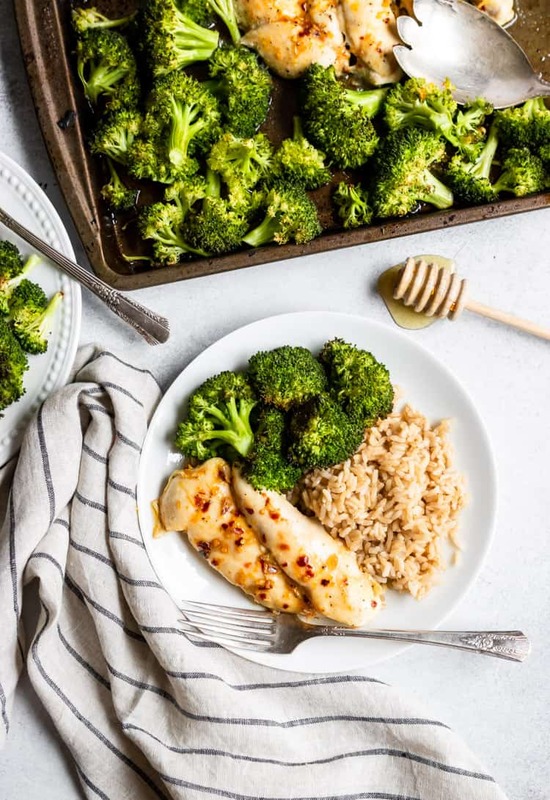 Juicy, sweet and sticky chicken with crispy broccoli make this Orange Chicken Sheet Pan Dinner a simple favorite for everyone. Less mess and a healthy, hearty meal for the family! 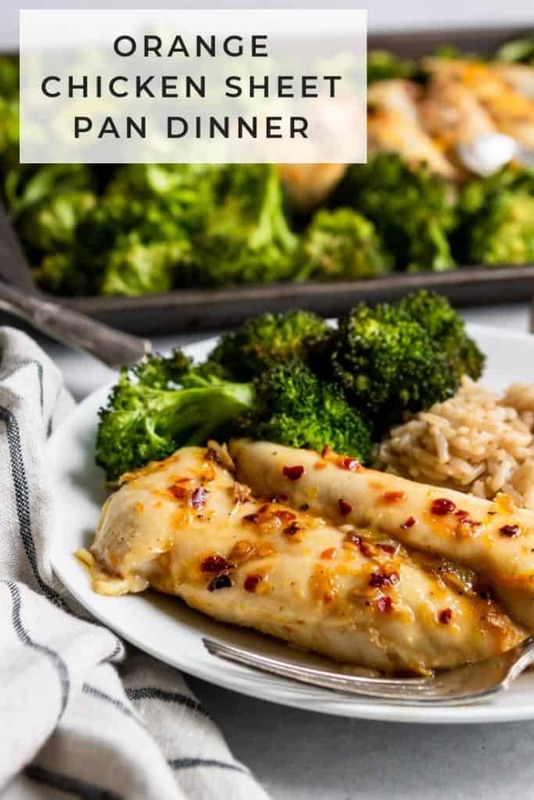 Winner, Winner, Orange Chicken Sheet Pan Dinner! 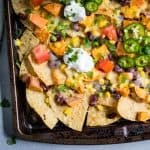 You all know my love/hate relationship with cooking dinner so yet another sheet pan dinner to the rescue! 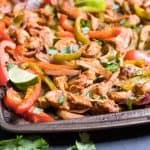 These are my favorite, favorite, FAVORITE kinds of meals–not a lot of mess, not a lot of effort, and lots and lots of goodness for dinner! I wish I could tell you dinner is so much fun to cook, that I loooove thinking of new things to make each night to feed the hungry family and that dong dishes is my very favorite thing. Sorry friends, I cannot lie to you. I just can’t do it. So when in doubt, sheet pan it out!!!!! 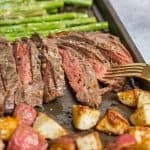 Probably the most popular sheet pan meal on the blog is my Parmesan Crusted Steak and Potato Sheet Pan Dinner but I am pretty sure this new recipe is up there as well. 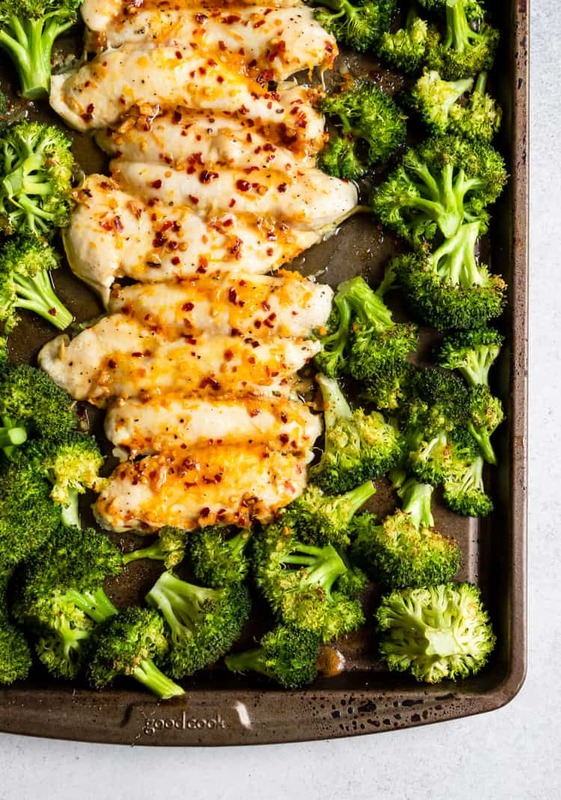 Why are sheet pan dinners the best? They are so stinking simple–toss all the ingredients on the pan and bake is typically all you need to do! Less clean up–that’s really the big win for me. A bowl to whisk the orange, honey and seasonings together is all you really need. I toss the broccoli in this one right on the pan with the olive oil and seasoning. Sooooooo many options! Grab a protein, some veggies, and a starch and toss it all together with your favorite spices. Dinner is served! I’ll share a little something about this recipe. It took me three tries to get the photos just right for this recipe. So that means we ate a LOT of orange chicken in our house for a while there. And you know what? Not one complaint. NOT. ONE. In my house, that is a really big deal! I imagine it may be the same in your house as well. There is just something about pairing that fresh citrus flavor, sticky sweet honey and then a touch of spice with your chicken. It was just meant to be! 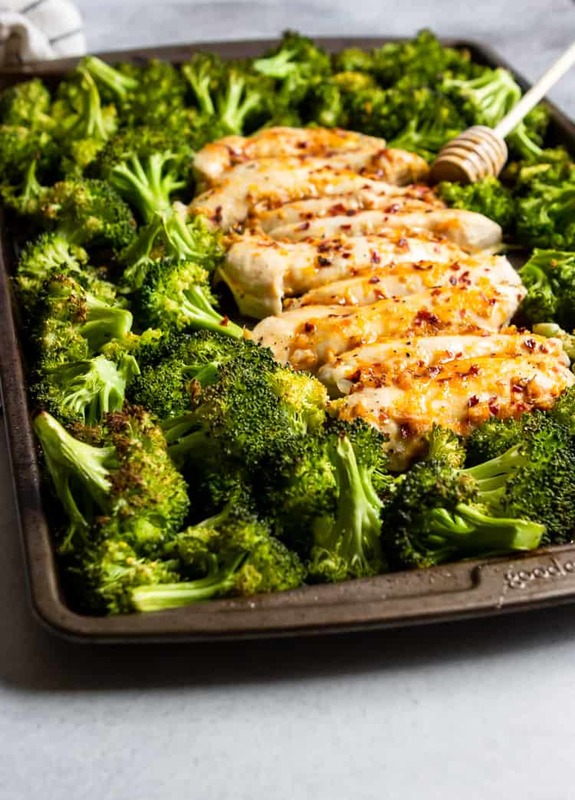 It only takes a couple minutes to whip up the marinade for the chicken and then prep the broccoli. And if you’ve got minute rice or rice already prepped for the week, then you are pretty much set once you put the pan into the oven. 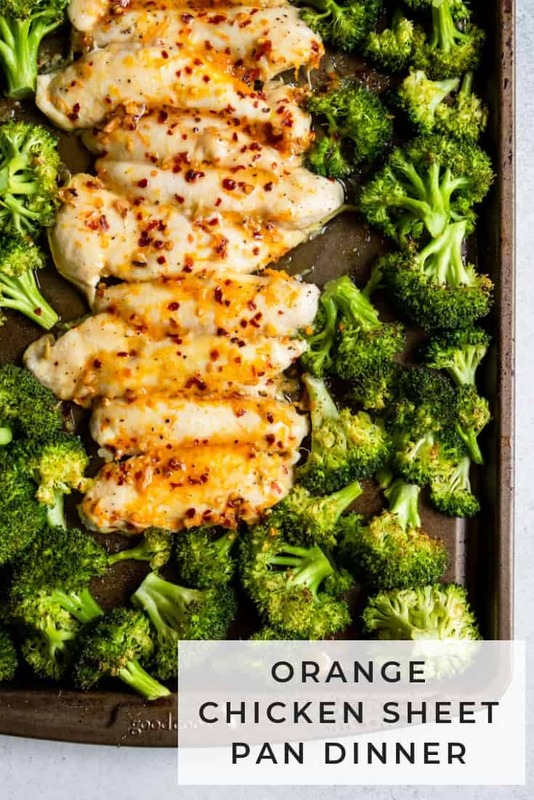 You may be interested in using chicken breasts for this Orange Chicken Sheet Pan Dinner, I get it. That’s basically what we all have in the house on any given day. The thing is, the tenderloins are what cook up in the same time as the broccoli. If you really want some orange chicken and you only have breasts, just cut them in half to thin them out a bit. That should do the trick. And as far as the broccoli goes, just a nice dusting of garlic, salt and pepper is all you really need to season. 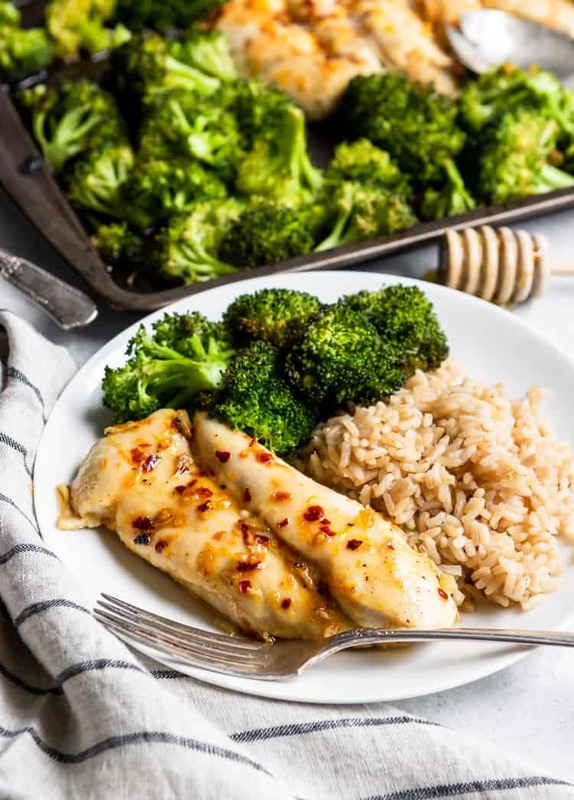 A little bit of the orange and honey marinade seeps off of the chicken and onto some of the broccoli to add a touch more flavor but I think if I would have tossed the broccoli in the marinade as well it just would have been way too much, ya know? I think you are all set for dinner now! 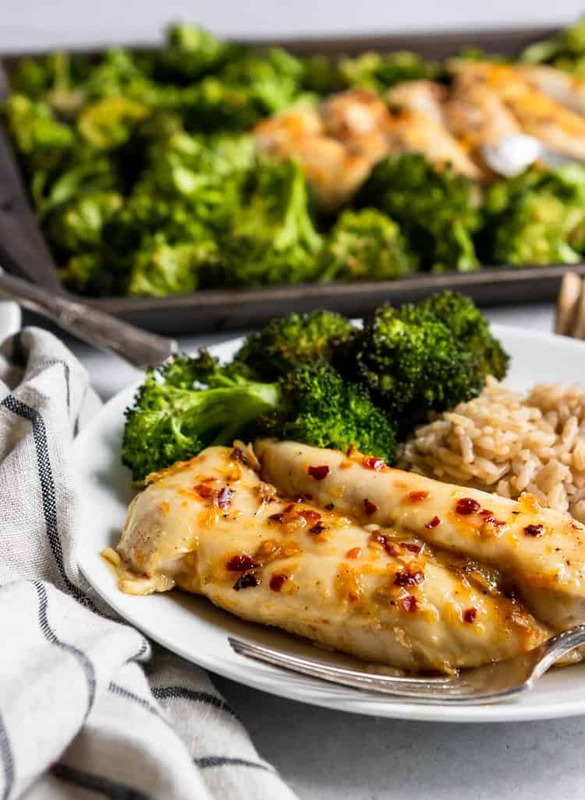 Grab some broccoli, chicken and a fresh orange, maybe some minute rice and a few other things and dinner will be ready in no time! Like I mentioned, I used chicken tenderloins. I found that they cooked at just the right pace as the broccoli. If you just have chicken breasts, then cut them in half long ways to make them more tenderloin like. That should do the trick! If you are planning ahead, you can mix the orange marinade together and toss it with the chicken in a ziplock bag and allow it to really it to marinade until you are ready to cook. That definitely kicks up the juicy flavor but is not necessary. These meals are supposed to be simple, so keep it that way! Sunday meal prepper?? Make this and dish it out into your Tupperware so you are set for the week! Feeling spicy? Add more red pepper or kick up the heat with a bit of siracha or hot sauce. The last time I made it I went all in on the spice and got a high rating from the hubby for that one. Those are hard to come by so I take them when I can them. Cut stems from broccoli and break into florets. 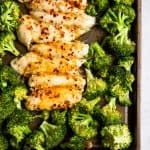 Toss 2 tablespoons olive oil, dash of sea salt 1/2 tsp garlic powder and cracked pepper together so that broccoli is coated. This should double as oiling the sheet pan as well. Spread the broccoli out to the edges of the pan. In a small bowl, whisk together honey, orange juice, orange zest, 1 T olive oil, ginger, garlic cloves, red pepper and sea salt (about 1/4 tsp or to taste) and pepper. Line chicken in the center of the pan. Season with salt, pepper and garlic powder as desired (I like garlic, can you tell??) Spread marinade evenly over chicken. Place in oven and bake for about 20 minutes or until chicken reaches 165°F internal temperature. When you pull out the pan, some extra liquid will most likely be on it. Blot it with a paper towel or pour it gently off the side. Serve with rice or as desired! I like to add an extra drizzle of honey and a garnish of red pepper when serving.